Since his Hollywood debut with 1942’s THE MAJOR AND THE MINOR, director Billy Wilder had steadily built of a filmography of ever-increasing excellence, culminating in 1950 with what’s come to be regarded as his supreme achievement, SUNSET BOULEVARD. However, no director– not even one of Wilder’s stature– is immune to the fickle nature of both the audience and the critics. The year 1951 saw Wilder release his follow-up to SUNSET BOULEVARD, a misanthropic portrait of journalism’s inherent ugliness laid bare: ACE IN THE HOLE. Perhaps the film’s subject matter cut a little too close to comfort for critics, as they widely panned Wilder’s bracing vision and advanced their own self-interest by using their public platform to scare off any sort of sizable audience (thus validating Wilder’s cynical thesis). Efforts to rebrand the film with a title change also proved unsuccessful, and for a long time, ACE IN THE HOLE languished in obscurity until a new generation of cinephiles uncovered the treasures contained within. The script for ACE IN THE HOLE – written by Wilder, Lesser Samuels, and Walter Newman– was inspired by two real-life events in which someone’s entrapment caused a media sensation, but it’s also informed by Wilder’s own direct experience as a journalist in Berlin during the 1920’s. The story concerns Chuck Tatum (Kirk Douglas), a tough-as-nails journalist with an abrasive working style that’s garnered him a lot of unfavor with the big papers back East. He’s washed out into the arid desert town of Alburquerque, New Mexico, where he’s managed to talk his way into a gig with the local newspaper at a fraction of the price he used to command. After nearly a year spent languishing in limbo, Tatum’s big break finally arrives in the form of Leo Minosa (Richard Benedict), a local miner who’s managed to trap himself deep under a mountain. Bad luck for Leo, but divine intervention for Tatum– this type of story usually generates a media frenzy, and he’s got the exclusive scoop. A huge crowd immediately descends upon the site, drawn in by Tatum’s calculated reporting. The longer this story runs, and the more suspense that builds, the more valuable Tatum’s stock becomes. Because nothing– not even basic human empathy– will stop him from exploiting this story for all its worth, Tatum sabotages all rescue efforts so as to delay Leo’s extrication from the mine for as long as possible (risking Leo’s death in the process). Meanwhile, he also finds himself grappling with other townspeople looking out for their own self-interest: Leo’s jaded wife (Jan Sterling), who sees Leo’s entrapment as a clean exit from her unhappy marriage, and the town sheriff (Ray Teal), a corrupt lawman up for re-election. ACE IN THE HOLE would be the boldest film in any director’s career, putting human misery and suffering up on display and charging you a quarter a pop for the privilege. In Wilder’s hands, however, the film becomes truly arresting– a prescient prediction of the wolfish, spectacle-obsessed and screaming-headline 24-hour news cycle that dominates our current landscape. ACE IN THE HOLE remains just as relevant today as the day it was released. Kirk Douglas brings his typical barnstorming, scenery-chewing style of performance to ACE IN THE HOLE, subverting his reputation as a lantern-jawed and virtuous leading man with an undercurrent of arrogance and contempt. Douglas’ bravery here is commendable, as he commits wholeheartedly to his character’s serpentine brutalism. The DNA of modern antiheroes like Don Draper, Frank Underwood and Walter White is vested within Tatum, the grandfather of irresistibly-unlikeable protagonists. As it stands, Tatum is far from the only despicable character within ACE IN THE HOLE– he’s complemented by a veritable rogue’s gallery of self-centered opportunists, weak pushovers and oblivious rubberneckers. Jan Sterling plays Lorraine Minosa, Leo’s bleach-blonde wife, as a delicate creature made tough and cynical by the unforgiving landscape around her. She may not be all too sophisticated or glamorous, but she’s every inch the femme fatale type that Wilder has featured in his previous work. Robert Arthur plays Herbie Cook, a fresh-faced photographer who’s easily seduced by Tatum’s hustling, take-no-prisoners approach to journalism. Ray Teal’s Sheriff Gus Kreitzer is hopelessly corrupt, willing to shamelessly leverage the media circus for his own political gain. Porter Hall plays Jacob Boot, the Albuquerque newspaper editor whose small-town, teetotaler values are entirely ineffectual against Tatum. Frank Cady represents a disdainful reflection of the audience itself as the Okie tourist Al Federber, who jostles for the best viewpoint from which to uselessly gawk at the commotion. Really, the only decent person in the entire film is the one at the center of it all– the trapped Leo Minosa, played by Richard Benedict. However, even he is not spared Wilder’s contemptuous wrath. His decency and innocence makes him a fool; painfully oblivious to his wife’s contempt for him as well as Tatum’s empty promises of salvation. He’s the only character in the film that actually trusts anybody, yet this is a character flaw for which he pays the ultimate price. Wilder’s belief in the primacy of the script over the visuals often translates to non-showy, utilitarian cinematography, butACE IN THE HOLE’s visual presentation is highly expressive indeed. The film pursues something of an epic scale, matched only by his previous war films FIVE GRAVES TO CAIRO (1943) and A FOREIGN AFFAIR (1948). Towards this end, Wilder recruits the latter’s cinematographer, Charles Lang, to artfully constrain New Mexico’s sprawling desert vistas and colors within the 1.37:1 35mm black-and-white film frame. Deprived of both a wide canvas and color photography (both of which existed then but had yet to become ubiquitous or cost-friendly), Lang had only light at his disposal– but like any cinematographer worth his salt, light was the only tool he needed. ACE IN THE HOLE enjoys a dubious distinction as a film noir set in a place where the blinding sun and open expanse chokes out any shadows that might gather. Wilder and Lang render the dusty, arid environs in blinding, almost-overexposed highlights, emphasizing just how little shelter there is to be found. What little shelter there is– Tatum’s dingy quarters, the ramshackle general store, the labyrinthine mine– allows for the shadowy, low-key lighting scheme typically found in the noir genre. Wilder uses these interiors to add texture to the light itself, filtering it through various architectural details and shapes instead of letting it simply fall upon the action unrestricted. With the cavern mine sequences, light pools into concentrated shafts surrounded by inky, impenetrable darkness– forming something of an expressionistic dreamscape that reflects Tatum’s own twisted interior state the further he descends (2). The allegory is clear: his quest to scoop the story of a lifetime is digging him into a hole he won’t be able to climb out of. As far as Wilder’s technical craftsmanship as a director goes, ACE IN THE HOLE exhibits a noticeable degree of growth and willingness to step outside his comfort zone. As an artist whose own personal zeitgeist coincided with the golden age of glossy studio filmmaking, Wilder preferred the control of a soundstage over the chaotic realism of location shooting. The mostly-exteriors action of ACE IN THE HOLE necessitates Wilder’s venturing out into the field and the embrace of environmental factors he can’t control. In return, he is able to capture a vibrant and dynamic sense of immersion that simply can’t be replicated on a studio set. The scale is almost epic, especially during the crowded carnival scenes where Wilder shows us just how out of control Tatum’s grip on the situation is. His camera moves appropriately to his scope, utilizing sweeping dollies and cranes to match his endless vistas, yet is still motivated primarily by character. Wilder’s highly-disciplined style of filmmaking dictates that he sets up his shots to cover as much movement and story as possible. In Annie Tresgot’s 1980 documentary PORTRAIT OF A “60% PERFECT MAN”, Wilder sums up his reasoning for this approach thusly: “anytime you move the camera, it’s a loss of time”. This no-nonsense philosophy might seem old-fashioned to some (especially in our current climate of cinematic excess), but Wilder’s natural talent as a director infuses his simplistic setups with a profound power and resonance that’s sorely lacking in modern Hollywood’s sensory-overload style. To achieve this, Wilder covers most of his scenes in wide masters, emphasizing depth via careful composition and deep focus. More so than his previous features to date, he uses close-ups more frequently here, and thus underscores the sense of entrapment inherent in both the narrative plot as well as Tatum’s tunnel vision. 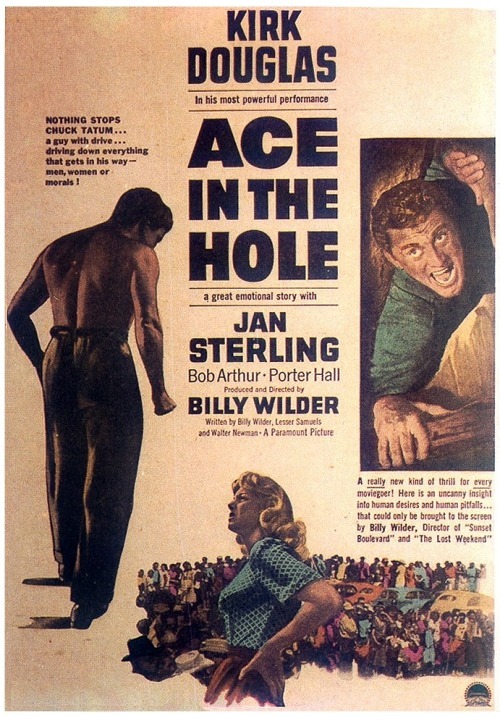 ACE IN THE HOLE serves as a sterling example of Wilder’s legacy as one of our greatest economical storytellers, a prominent practitioner of what I like to call “muscular minimalism”. ACE IN THE HOLE sees Wilder fully in command of his crew’s service to his desired tone. Every artistic choice and opportunity– from Edith Head’s rough-hewn costumes to Hugo Friedhofer’s brassy score– is dialed into Wilder’s vision with a laser-like degree of precision. The cynical, misanthropic bent of his approach is consistent from end to end of the production. It’s already present in the screenplay (see Sterling’s bullseye-on-tone line, “I don’t go to church, kneeling bags my nylons”), and sustains all the way through to the little finishing touches (like the trivializing of Leo’s plight in the form of an insipid radio-friendly country ballad about him and performed mere steps away from where he’s fighting to survive). Wilder’s history with pushing the boundaries of what was considered “in good taste” for American cinematic narrative informs a world seemingly populated entirely by adulterers, liars, cheats, and self-interested opportunists. Perhaps Wilder is able to get away with it because he takes great care to show the consequences of his protagonists’ wicked actions. Following the ill-fated antiheroes of DOUBLE INDEMNITY (1944) and SUNSET BOULEVARD, Douglas’ Chuck Tatum is the third Wilder leading man whose pursuit of redemption is ultimately thwarted by his own self-destruction (2). Also like Wilder’s previous male protagonists, Tatum is a man whose identity is synonymous with his line of work. He’s firmly middle-class, caught in a limbo state between the small, low-rent Albuquerque newspaper and the bigtime Gotham outfits. He may be on the downslope of his career, but the beauty of his transient state is that he can turn his luck right around and become a free agent, selling his exclusive services to the highest bidder. This story aspect reflects that uniquely American narrative of governing your own destiny and breaking out of your social class by the force of sheer will and determination– an admittedly-idealistic perspective, to be sure, but one that was informed by Wilder’s own personal experience as an immigrant himself. ACE IN THE HOLE doesn’t pull any punches in regards to its less-than-sunny disposition towards human nature. Wilder’s previous narrative risks had paid off fairly consistently, but here the general consensus at the time was that the well-respected director might have overstepped his bounds. Despite earning him an Oscar nomination for Best Screenplay and doing brisk business in Europe, the film opened with a reverberating thud in America– giving Wilder his first true taste of financial AND critical failure. 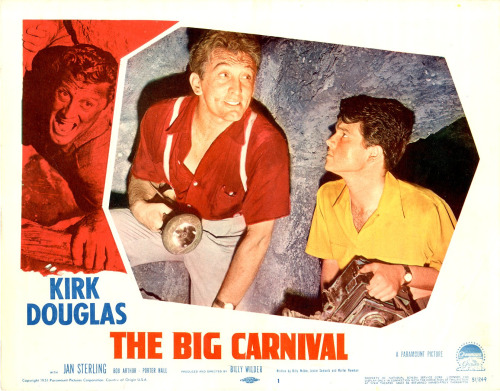 In a bid to salvage the sinking ship, studio executives took the film away from Wilder and re-released it under a new title – “THE BIG CARNIVAL”– without his consent (and in the process, ironically proving that they missed the whole point of his message). ACE IN THE HOLE languished for decades under its new, bastardized title, and it would take a cultural reappraisal spurred on by frequent broadcasts on the Turner Classic Movies channel for the film to reclaim its original title. The ultimate irony of art is that, while it is a trade that prizes spontaneity and the ability to capture the essence of the present moment, a given work’s true quality can only be assessed in hindsight, removed from the context of its time. In this case, it took audiences more than a generation to catch on to what Wilder already knew– that ACE IN THE HOLE was one of his best works. ACE IN THE HOLE is currently available on high definition Blu Ray via The Criterion Collection.